One of the highlights of mainstream modern jazz to accompany the small hours and a dry martini: late nights were made for this. AllMusic compliment it as “pleasing and laid-back” but Cook and Morton give a better account: ” A Mulligan session marked out by superior playing from both Farmer and Brookmeyer. Mulligan is somewhat muted as he concentrates on filling out the middle of the orchestration. Hall is the key to the whole thing, endlessly inventive and subtle, who takes great chances without fanfare ” A first class sextet with a restrained contribution from the leader. Several tracks lay down a soothing Samba-accented beat, in newly fashionable Brazilian flavour. The later jazz flirtation with the hotter Bossa Nova has not worn as well over time, but the Mulligan temperature here is just right, passing the midnight test without demure. Chopin’s Prelude in E minor was a surprise – I didn’t know Chopin did Samba, the Warsaw Concerto meets Come Dancing, but it works well. Sixties retro cover! Picture on the wall! The liner notes aspire to literary pretensions – “the air was sweet, the cigarette was shared…” as the musicologist gives way to the copywriter, lifestyle is born. The quality of Philips pressings for their own Philips label I have generally found a little flat and lifeless compared to their pressings for Riverside and Fontana, however Philips have done a good job here. UK Philips pressing for the Philips label, code 420. I was sceptical of the price asked in a London shop, but was assured “it sells for surprisingly high price” more than you would expect for “another Mulligan”, because it is no ordinary Mulligan.The most valued copies are unsurprisingly M- white label promos which fetch up to $200, and the US Stereo release hit $100. Then there are the UK, Japanese, and Philips own budget label “Wing” releases at a more reasonable price. Popsike turned up US mono, US Stereo, Mercury/Wing, Japanese, and European Stereo blue label, all in addition to the UK Philips, all of whom lay claim to being “rare” and “an original”. You pay your money, you make your choices. Being a white label promo is no indication of who has played it on what in the last fifty years, but can be an assurance that it was one of the first pressings off the stampers, and may, just may, have lain dormant for a few decades in a DJ library. 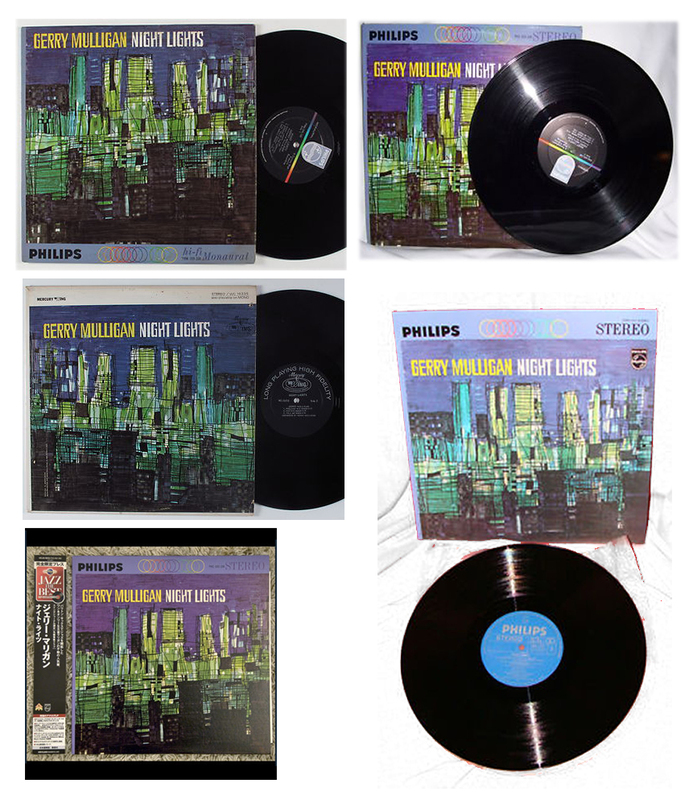 This entry was posted in Gerry Mulligan, Philips and tagged Art Farmer, Bill Crow, Bob Brookmeyer, Dave Bailey, Gerry Mulligan, Jim Hall, Philips, Samba by LondonJazzCollector. Bookmark the permalink. Hi! Do you know the name of the artist who painted that amazing cover? While the liner notes contain a great amount of detailed information, like the type of microphone used on the flugelhorn and how many inches-per-second the tape machine ran, the cover art is unfortunately uncredited. The graphic designer was Oliver Hardimon but he passed in 2009. Thank you so much for the information. I really like your website, even though I’m not a jazz expert. 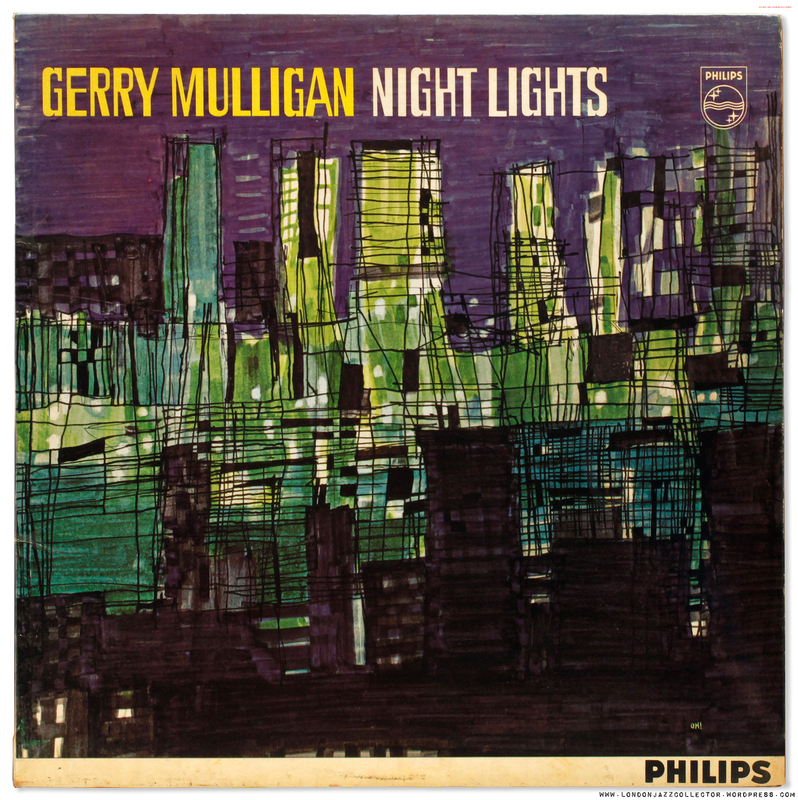 But Gerry Mulligan keeped me good company while studying for an exam. Greetings from Italy, and thank you again! I’m a complete newcomer to Jazz music and I’m very glad I found this website. I’m looking for recommendations of albums that sound like this one. 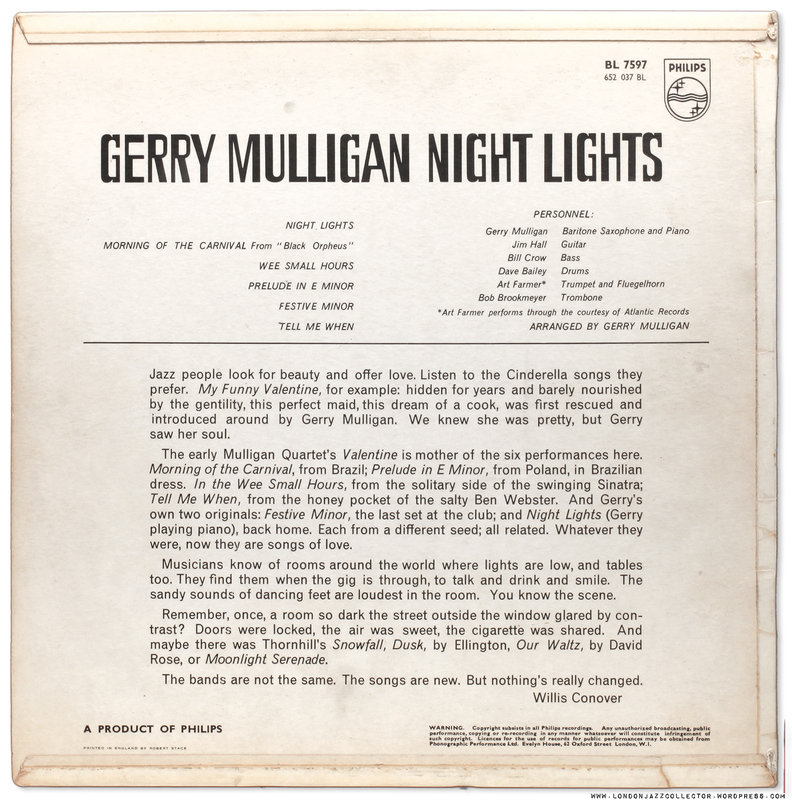 Naturally, I first browsed through Gerry Mulligan’s discography but sadly found out that he never recorded another album as laid back as this one. Jim Hall’s records with Bill Evans seem to go in the right direction but they’re lacking the instrumentation of Night Lights and seem faster in tempo (which seems to be the case for most albums that I was suggested). The closest recommendation that I’ve gotten is Kenny Dorham’s Quiet Kenny (well, the tracks My Ideal and Alone Together to be specific). I’m desperately looking for more like Night Lights; records, that a relatively quiet and soothing from the first song to the last, with reserved drumming and a quiet guitar (or piano), that don’t pick up the tempo too much. I’d be very thankful if someone could help me or push me in the right direction! I think you’ll quite like Chet Baker “Chet” on Riverside. I have the web/html skills of a potato – no, possibly less. Everything here is fully hosted and managed by WordPress. I believe it looks a little odd on an ipad, but that’s Apple for you. Sorry I can’t offer advice on such things. LJC, another little treasure well spotted. Although I have some Mulligan, this wasn’t amongst them — until today. I just picked up a Philips Wing copy for a fiver which oddly looks a little unlike all the cover variants you show. Bottom right has a Philips ‘star’ logo over the graphic, and top right has a ‘Wing’ logo. I’m guessing that Wing are slightly later represses. Whatever the case, this is, as you quite rightly said, exceptionally beautiful late night jazz, and superbly recorded. The surprise track — because it works like a dream is Chopin’s Prelude in E Minor, the opener on side 2. A record I wouldn’t have considered without your prompt. There’s no mention of the record title, though. An East German pressing?. Liner notes I hope complete with latest tractor production statistics, and good news that the grain harvest once again breaks all previous records, despite bakery shelves being empty. Glorious days. Listen, even THAT would be preferable to the sleeve notes on the original….. I have this one as an Eastern German pressing on the Amiga label, in stereo (1984, maybe). It is easily one of the best sounding records I own. I think they got their tapes from West Germany in Hamburg and managed to make a flawless pressing. The cover is not so nice, though, sporting a 1970s photo of Mulligan, the one he used on the The Age of Steam” cover.